Tudor Cottage01263 715779work01603 870304fax Self-cateringTudor Cottage, a stunning period property that has all the conveniences and luxuries of modern living, that is an ideally situated base for both trips to the beach and travelling around this beautiful part of Norfth Norfolk. The cottage is comfortable and spacious and has a lovely large landscaped garden for those days when you don't feel like venturing too far. Notes: Steep stairs to Bedroom 3. Mobile phone signal: variable. If Sofabed required, please request on booking. No dogs allowed but owner's dog occasionally visits. Starter pack of fuel will be provided in the winter months. Tudor Cottage offers weekly bookings starting on Friday. 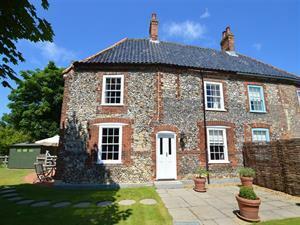 Tudor Cottage, a stunning period property that has all the conveniences and luxuries of modern living, that is an ideally situated base for both trips to the beach and travelling around this beautiful part of Norfth Norfolk. The cottage is comfortable and spacious and has a lovely large landscaped garden for those days when you don't feel like venturing too far.